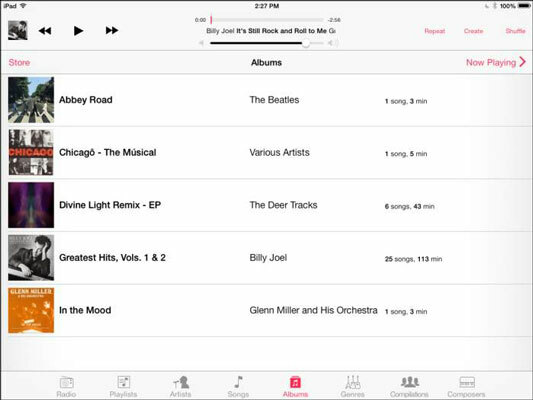 After you have some audio content on your iPad in the form of music, podcasts, or audiobooks, it’s organized into collections, and you can find that content by categories such as artist or genre with predefined category buttons along the bottom of the Music app screen. You can easily view the contents of your library collections, which you may have synced from your computer or shared over a network, pushed to your device through iCloud, or downloaded directly using iPad’s Wi-Fi (or 3G or 4G, if you have a 3G or a 4G+LTE iPad) capability. Tap the Music app icon located in the Dock on the Home screen. The Purchased button appears only if you’ve already obtained content on iTunes. Tap the Radio button (see the figure) to view this new feature in iOS 7. The iTunes Store has several free items you can download and use to play around with the features in Music, including music and podcasts. 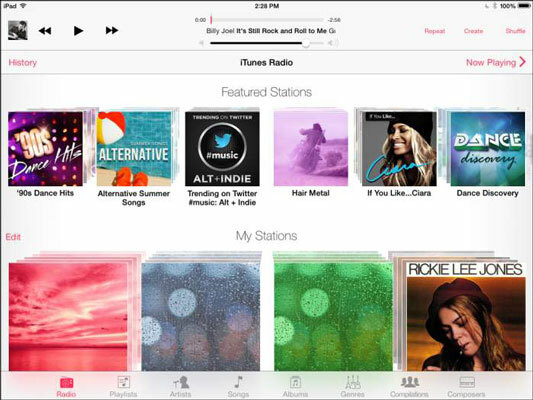 You can also sync content stored on your computer or other Apple devices to your iPad and play it using the Music app. Apple offers a service called iTunes Match. You pay $24.99 per year for the capability to match the music you’ve bought from other providers or ripped from CDs (and stored on your computer) to what’s in the iTunes Store inventory. If there’s a match (and there often is), that content is added to your iTunes library at 256 Kbps. If there’s audio that isn’t a match, it’s uploaded to iCloud and synced to your iPad. Then, using iCloud, you can sync the content among all your Apple devices. The upward limit of 25,000 tracks works for most users. You can use the iTunes Summary tab to make a setting to sync music at 128 Kbps. Doing this saves space on your iPad if you’re an avid music downloader. You can also make a setting for whether to download album covers in iTunes.